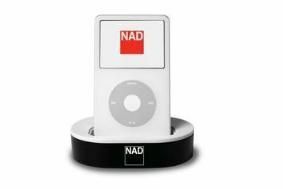 NAD introduces IPD 2 iPod dock | What Hi-Fi? There are analogue and S-Video connections for hooking the dock up to any AV receiver or stereo amplifier, and volume can be controlled via your NAD amp or receiver. Control and display of all the digital media on your iPod is available on NAD models fitted with a data port – currently that's the T785, T775, T765, T755 and T175 AV receivers. Alternatively, you can control your iPod directly with the dock's remote control that comes as standard. The dock automatically charges your iPod when it's in situ, and will work with any AC voltage from 100V to 240V. Plug adapters for different countries are included, as is a one metre connection cable for linking the dock to NAD systems. The NAD IPD 2 is available now, and is distributed in the UK by Armour Home Electronics.